All of the following photos are my own. Unless otherwise indicated, they were taken on my November 2001 vacation. 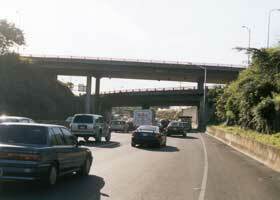 Hawaii has four Interstates (H-1, H-2, H-3, and H-201). One of them, H-201, was not signed as such until July 2004. 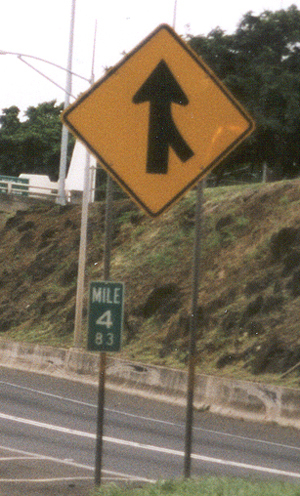 None of the Interstates have "begin" or "end" signs (which are rare on other Hawaii highways as well), though sometimes there's a terminal milepost or other sign indirectly indicating the beginning or end of the route. The captions below will point out where the exact endpoints are, based on my review of Hawaii DOT's straight-line diagrams for those routes. 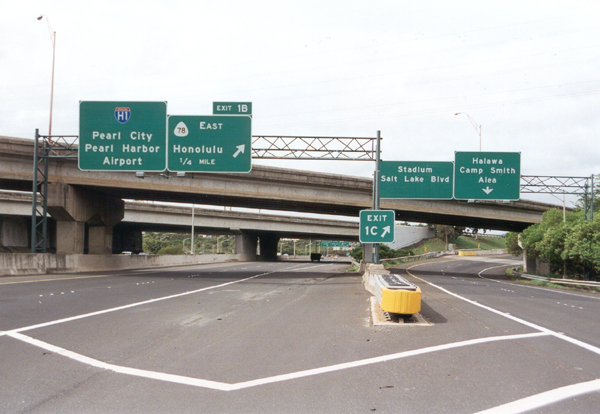 The west end of Interstate H-1 is about 300 feet west (on the other side) of the overpass in the background on the right, which takes Kalaeloa Boulevard (unsigned state route 95) over the freeway. 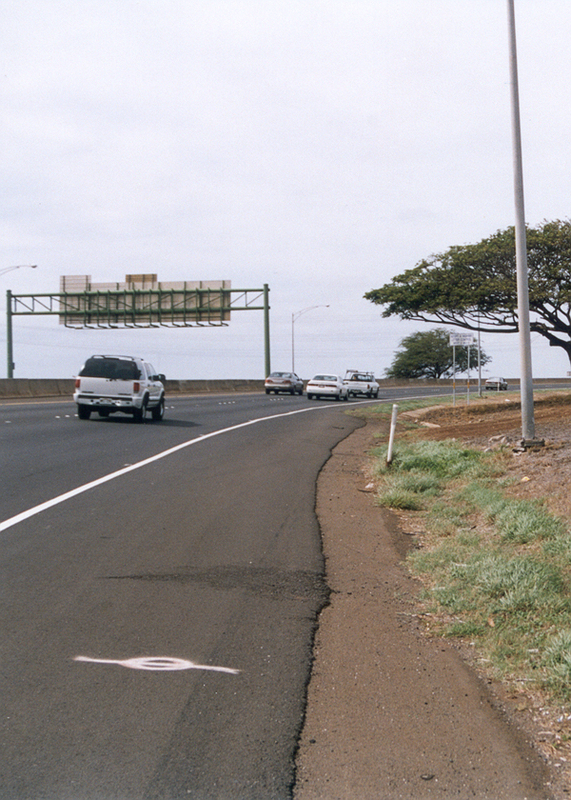 The crossed zero pavement marking on the westbound shoulder, and a similar marking painted on the median barrier, are the only indications of H-1's exact west end. 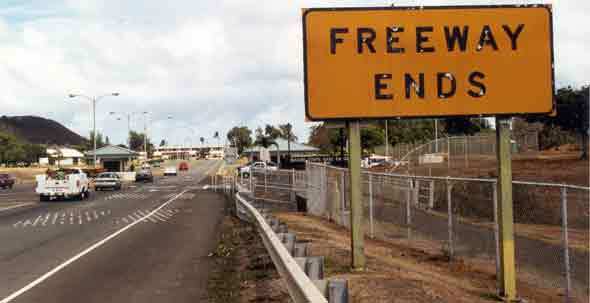 While the highway changes at this point from an Interstate to a state route (Farrington Highway, state route 93), it remains a freeway for a little more than a mile, until its at-grade intersection with Laaloa Street. 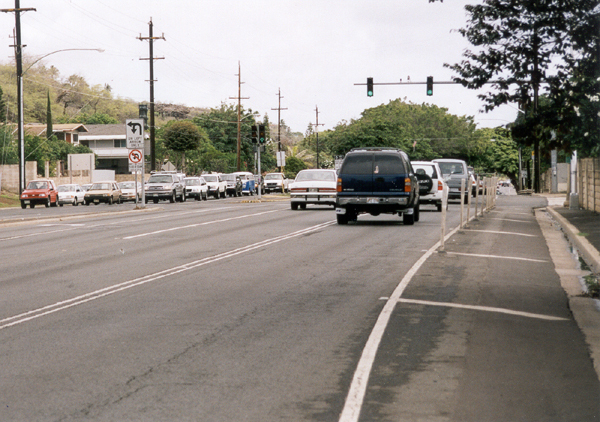 The two photos above, facing eastbound, show the east end of H-1 in Honolulu northeast of Diamond Head, at the intersection with Ainakoa Avenue. 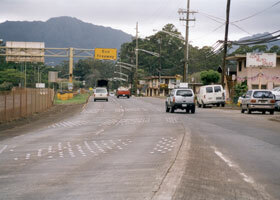 The highway continues beyond the intersection as the Kalanianaole Highway (state route 72). 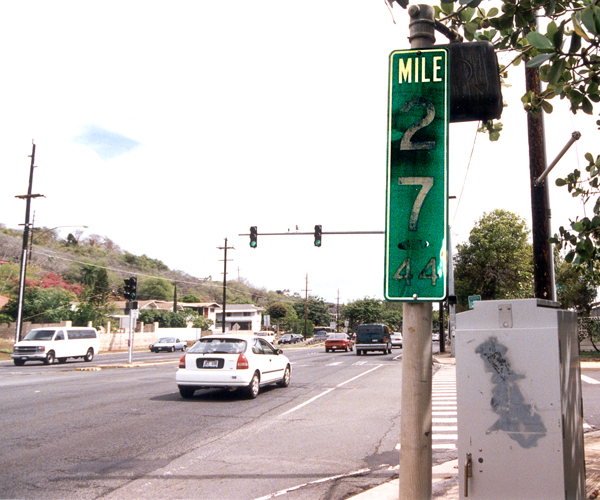 The formal end of H-1 is marked by the faded terminal milepost in the photo on the right, with a horizontal "44" under the vertical "27" (barely visible, even with digitally enhanced contrast for the very faded milemarker in this photo) to indicate that the route ends at mile 27.44 (about a quarter-mile longer than the actual route mileage). 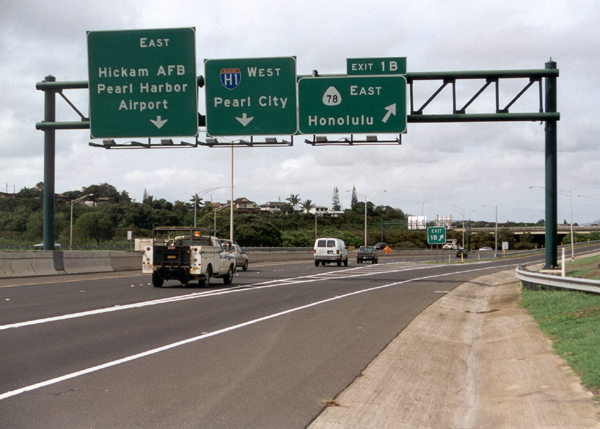 The exact north end of Interstate H-2 is just before the yellow "end freeway" overhead sign, and driveways for some of the establishments serving soldiers at the adjacent Schofield Barracks Army base. 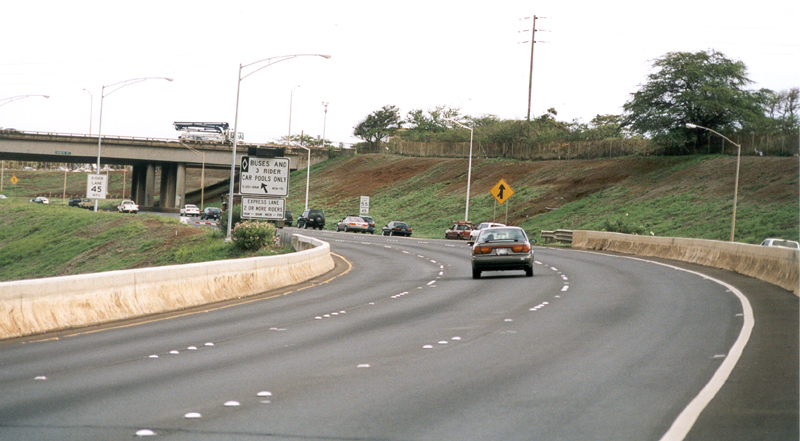 The on-ramp from the right carries traffic from the Kamehameha Highway (part of state route 99 south of H-2, state route 80 to the north). This highway continues beyond the "end freeway" sign as Wilikina Drive (also part of state route 99). H-2's south end is at this left entrance onto eastbound Interstate H-1. The white sign on the left indicates a left exit from the end of H-2 to H-1's "zipper lane" (eastbound- and morning rush-only, HOV-3 moveable-barrier-separated express lane, created from two westbound lanes). 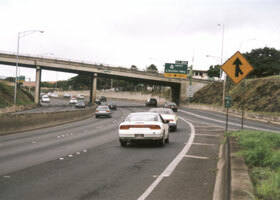 Interstate H-3's west end is technically at the junction with the Moanalua Freeway (now re-signed as Interstate H-201), though driving straight ahead through the junction will take you onto long ramps to westbound and eastbound Interstate H-1. 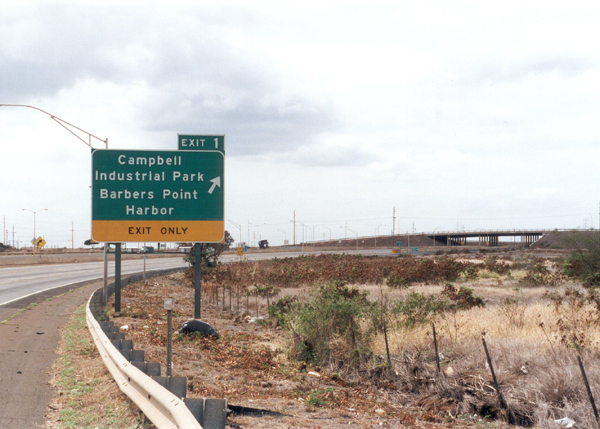 The photo on the left is an overview of the junction, from the westbound roadway north of the junction. 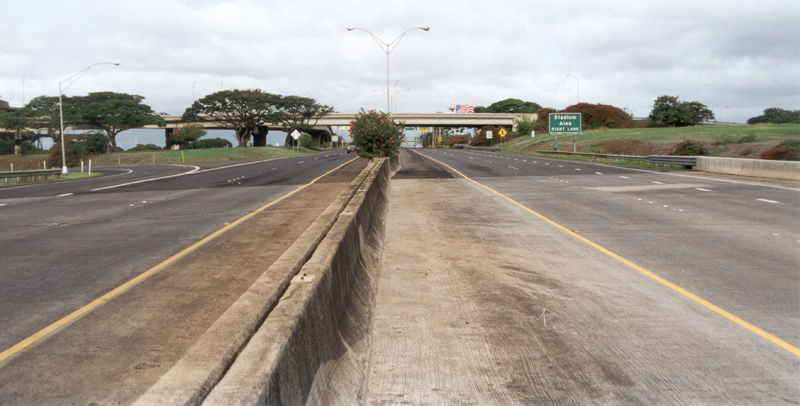 The photo on the right shows the unmarked formal end of H-3, 0.04 miles past the exit 1B off-ramp to the eastbound Moanalua Freeway. 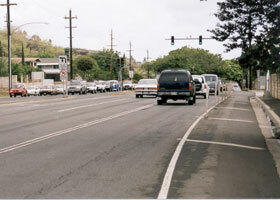 Two views of H-3's east end, at the main gate to Kaneohe Marine Corps Base Hawaii. The photo above was taken in September 1999; the one below, in May 2000. 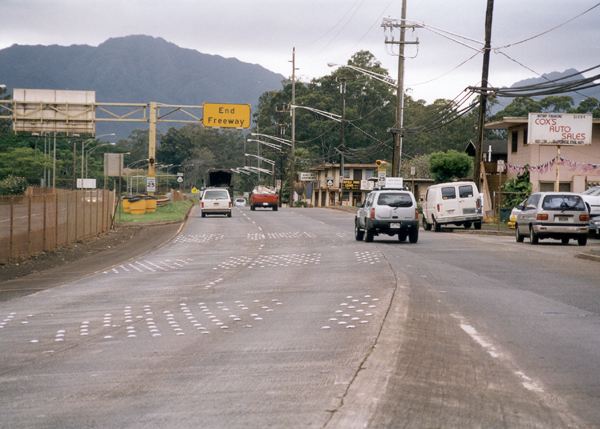 H-3's exact east end is 26 feet past the culvert from which I took the 2000 photo, within the crossover just short of the guard station (so unless the crossover is blocked to prevent a U-turn, you can cover every inch of H-3 without having to clear Kaneohe MCBH security). The exact western end of Interstate H-201 (until recently signed only as state route 78) is just ahead (west) of the bridge over Interstate H-1 on which I was standing, where the entrance ramp on the left from H-1 exit 13B merges with the through eastbound lanes. 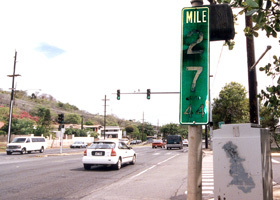 The Moanalua Freeway continues from this point about ¾ mile, designated as well as signed only as state route 78, to an interchange with the Kamehameha Highway (state route 99). 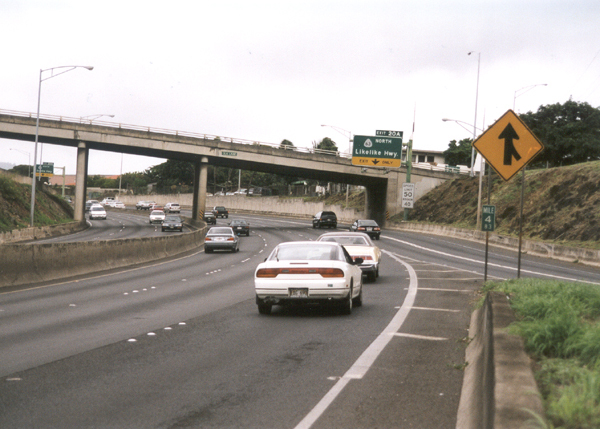 H-201 and the Moanalua Freeway merge at their east end into Interstate H-1, at the Kahauiki Interchange, viewed here from the eastbound H-201/Moanalua Freeway shoulder. 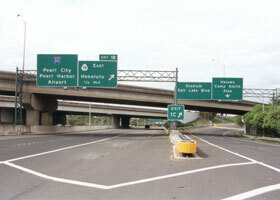 The middle level of this interchange is westbound H-1; the upper level is the Middle Street overpass. 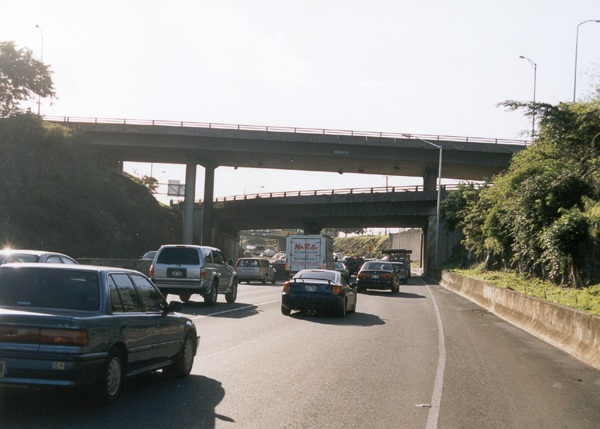 Within the Kahauiki Interchange, the eastbound H-201/Moanalua Freeway lanes (three lanes on the left) merge with H-1 eastbound (two lanes on the right) as H-1's eastbound lanes emerge from the Middle Street Tunnel, as shown in the photo above left. 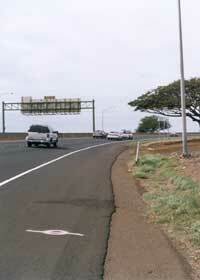 In the photo above right, a terminal milepost, mounted under the merge sign (reflecting the total mileage for the Moanalua Freeway, including the non-Interstate portion), marks the formal end of H-201. 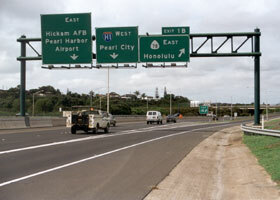 Go to Hawaii Highways - Road Photos overview page for more Hawaii road photos, including dozens of other photos of Hawaii's Interstates.